Built in the 1920s by the late San Francisco architect Clinton Day as his own residence, the Nob Hill penthouse’s graceful interiors highlight the sweeping city views and mirror the building’s overall aesthetic. The building, with its stunning façade and exceptionally decorative portico, became famous after it was featured in the classic Humphrey Bogart film “The Maltese Falcon”. David redesigned the space for the current owner by updating the finishes, while preserving many of the apartment’s original features, such as the coffered wood panel ceilings in the living room. 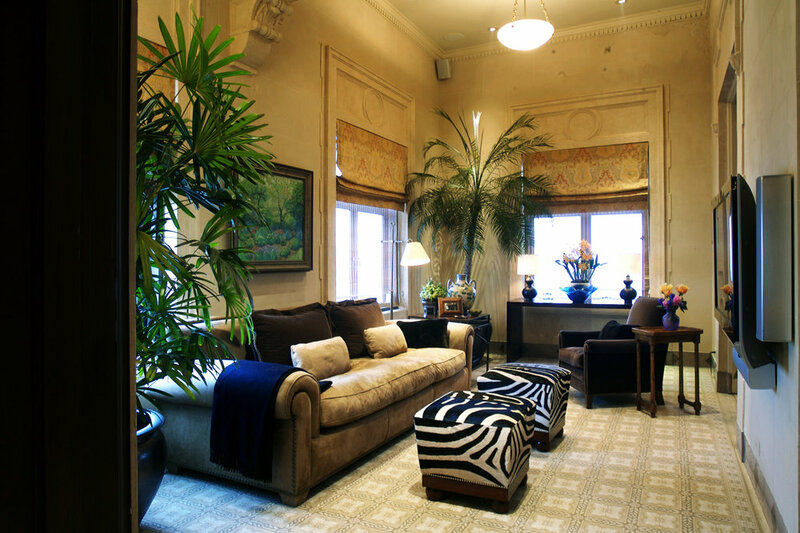 He transformed the former solarium into a family room with stunning trompe-l’oeiled limestone and 14-foot ceilings. The stunning residence is dressed with mirrored halls, granite counters, marble bath, limestone, dentelle and ceiling moldings, and parquet flooring.